Dubai, UAE, June 10, 2018: MG Motor has introduced its innovative new iLink application to the Middle East market, making life easier for its growing number of customers. 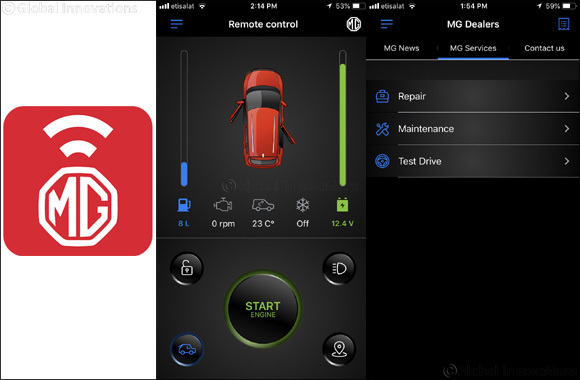 This smart phone application is the first in the Middle East to combine both dynamic and service features in one, providing users with a direct connection to their car. Key features allow users to monitor their driving history, receive service reminders, be alerted if their car is damaged, and track their vehicle. The innovative smart application, which is compatible with all MG models, ensures peace of mind by reminding customers when a service is required. Users can track their vehicle using geo-location identification, helping owners if they misplace their vehicle in a car park or lend their vehicle to a friend. MG iLink is the only application in the market to offer punch sensor technology, which alerts the driver if their vehicle is damaged, whether it is parked or being driven by a friend or a valet driver. Customers using MG iLink will also be able to step into a pre-cooled vehicle during the summer, using the application to turn on the engine, and consequently the air conditioning, in advance of getting into the car. During prolonged periods when the vehicle is not in use, the application can be used to schedule a time for the engine to be turned on for an hour every day. The ‘driving history’ feature can also be used to monitor driving behaviour, customers will be able to use MG iLink to download a daily report which tracks how much fuel they have used over a particular period, the locations visited and fuel costs. By viewing the history of all driver’s customers can ensure everyone is driving safely and maximising fuel efficiency. Since its acquisition of MG Motor, SAIC MOTOR, as a Global Top 500 company, has opened a new chapter for this British-born brand. Earlier this year, MG Motor introduced two SUV models to its new generation line up in the Middle East, the MG RX5 compact SUV and the MG ZS SUV, to complement its existing MG GS and MG 360 models.